On Nov. 1, the Centers for Medicare and Medicaid Services (CMS) released its much-anticipated final rule on the 2019 Physician Fee Schedule, which includes some simplifications to evaluation and management (E/M) documentation but delays other major changes. Beginning Jan. 1, 2019, Medicare will allow ancillary staff to perform and record the chief complaint and history of present illness. As the E/M documentation guidelines are currently understood and interpreted, these two elements of documentation must be personally documented by the performing provider – even if they are already recorded by another member of the care team. Medicare recognizes this requirement no longer reflects most providers’ workflow and represents an unnecessary redundancy in documentation. The proposed rule contained provisions concerning to many primary care physicians, including a single blended payment rate for office visit levels two through five for both new and established patient visits. The proposed blended payment rate was between the current rate for a level three and level four visit. 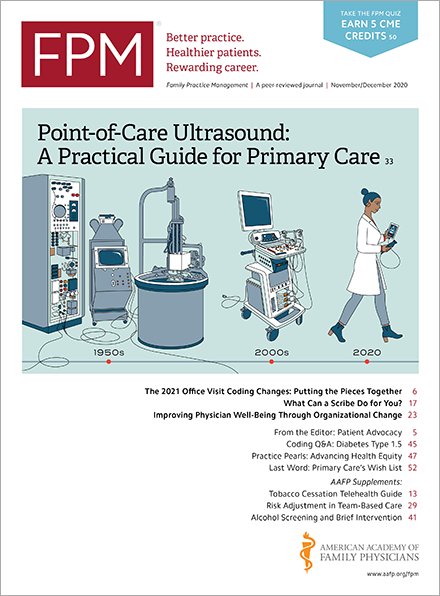 Despite the ability to add on a $5 primary care payment for the majority of services to Medicare patients, family physicians and others were concerned their payments would be substantially affected and expressed frustration with the differential between the primary care add-on code and the $17 payment bump offered for specialist visits. The final rule addresses some of these concerns. Although Medicare still intends to pursue a blended payment rate, it will apply only to levels two through four, leaving level-five office visits as an option for the most complex patients. And, recognizing the drastic change this represents, Medicare is delaying the effective date of the blended payment rate until Jan. 1, 2021. Notably, Medicare recognized the frustration with the proposed differential payment for primary care and specialty care add-on codes that may be reported in conjunction with this blended payment and, in the final rule, stated both services would be valued the same. Once the blended payment concept is applied to level-two through level-four office visits, the add-on code for inherent complexity for a primary care service can be reported in conjunction with the level of E/M service. Medicare notes it expects that certain specialties, like family medicine and internal medicine, would include this add-on code on nearly every visit. Documentation requirements will be relaxed in several ways once the new blended payment takes effect in 2021. First, providers will still be able to report any level of service for office visits. When reporting a level-two through level-four code, providers will only have to document the medical necessity of the service to justify the visit and to satisfy the requirements of a level-two service. This should help providers focus on clinical information that is relevant to the care of the patient, instead of worrying about whether they satisfied the complex documentation requirements of a code, particularly for level-four visits. Providers will be able to meet these criteria by using the existing rules under 1995 or 1997 E/M guidelines. Alternatively, providers will be able to code visits based solely on the medical decision making component of the E/M service, regardless of whether criteria for history or examination are met. Finally, providers will be able to select a level of service based on time. However, unlike current requirements that mandate greater than 50 percent of the visit be spent in counseling or coordination of care to use time as the controlling factor, providers will simply need to document that they personally spent the time described by each level of service face-to-face with the patient. While the goal of the final rule is to reduce physicians' documentation burden, in the short-term, providers should realize its limitations. First, most of the finalized rules will not take effect until 2021. Second, they will only apply to Medicare. Unless commercial payers adopt similar guidelines, providers may have different rules for different payers for a period of time. However, when Medicare eliminated payment for consultation codes nearly a decade ago, many commercial payers quickly followed suit. Finally, the rules only apply to office visit codes at this time. Providers using codes from various categories of E/M services like hospital care codes should recognize the current documentation requirements will still apply for the time being. For more information, read the AAFP News story on the final rule and the AAFP summary.